Today we present a little geometry lesson… After all, who can resist the clean-lined appeal of shapes like triangles, squares and hexagons?! Why go geometric? 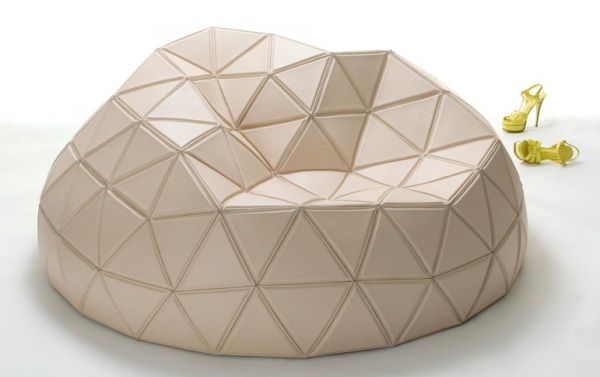 For one thing, the purity of geometric forms makes them ideal for a variety of design styles. There’s nothing like entering an ultra modern room that showcases a museum-quality geometric centerpiece. Those who are fans of the glamorous look may find themselves drawn to Hollywood Regency-style geometric patterns in decor such as textiles and accessories. Then there’s the scene-stealing aspect of geometric pieces. Often unusual or striking in their use of repetition, they are natural showpieces. 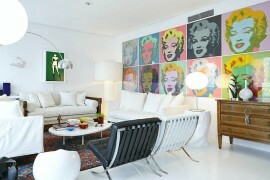 And who doesn’t want their decor to be the talk of the town?! 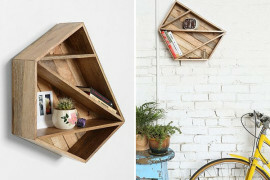 Below we feature a variety of geometric finds, from shelving to furniture and tabletop treasures. Go off the grid with these unusual pieces, and let them bring a mathematical element to your space! 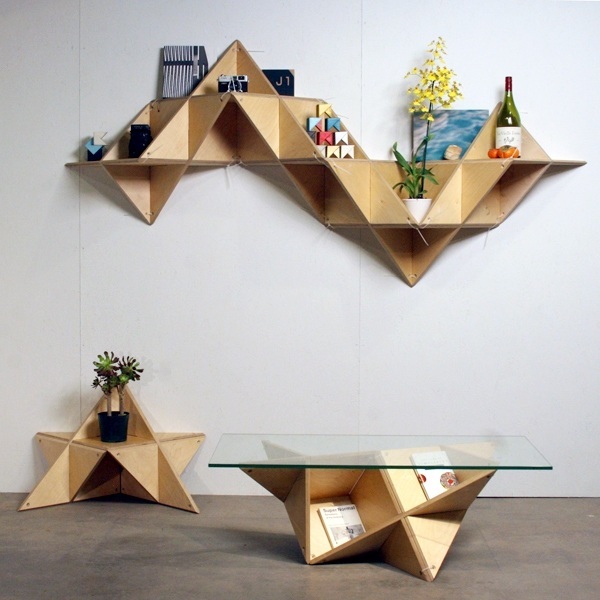 We begin with a shelf that can double as furniture! The T.SHELF from J1studio is a modular shelving system that can be arranged in a variety of configurations for the floor or the wall. With a triangular shape at the center of this design concept, it’s easy to see how pieces can form one-of-a-kind sculptures that serve key functions. 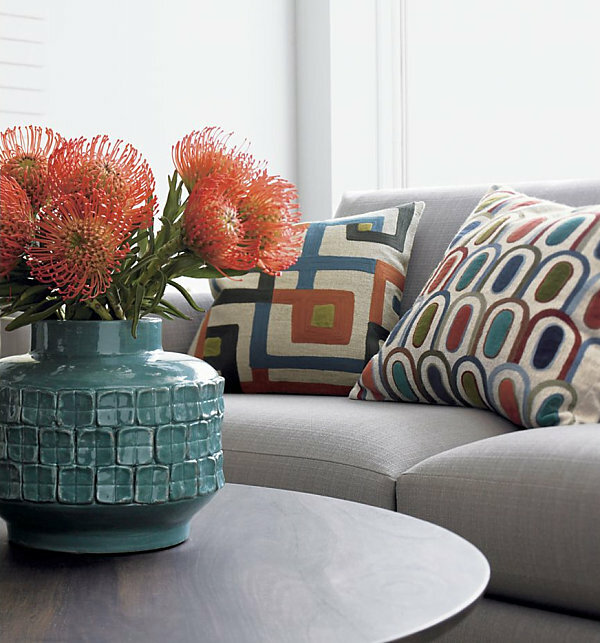 Don’t forget the appeal of upholstered geometric furnishings. 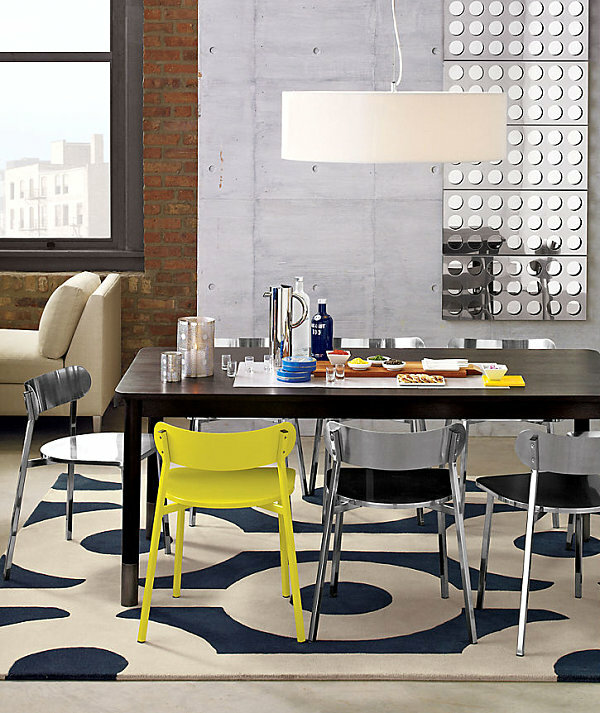 Like the Specs Chair in Trefoil from CB2, which features a design by Liora Manné. Green, turquoise and taxicab yellow are radiant in geometric triads that mirror Moorish tile work. Note how in the room below, the walls, flooring and other decorative elements are simple and sleek so the chair can take center stage. 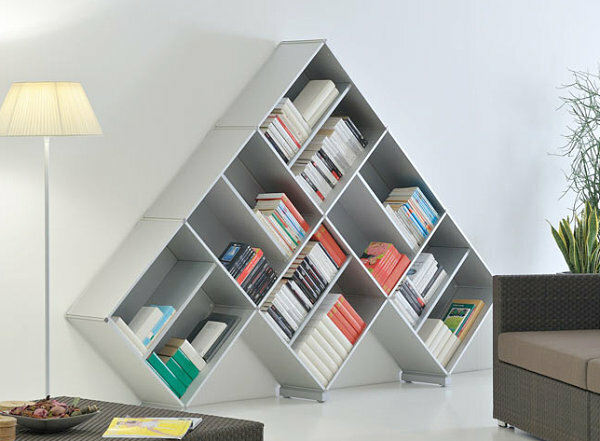 It’s a bookcase–that looks like it came straight from a video game or your favorite puzzle! We don’t know what’s more intriguing about the aluminum silver PYRAMID 3 Book Case from Fitting: the overall form or the way the books it holds lean in parallel and perpendicular patterns. 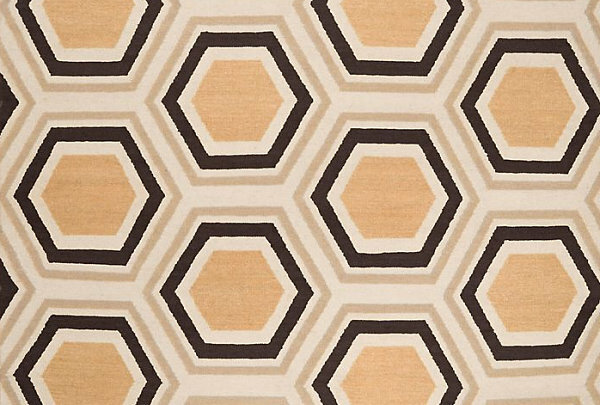 Thanks to the Hollywood Regency revival, a slew of geometric textiles and rugs are available for purchase. 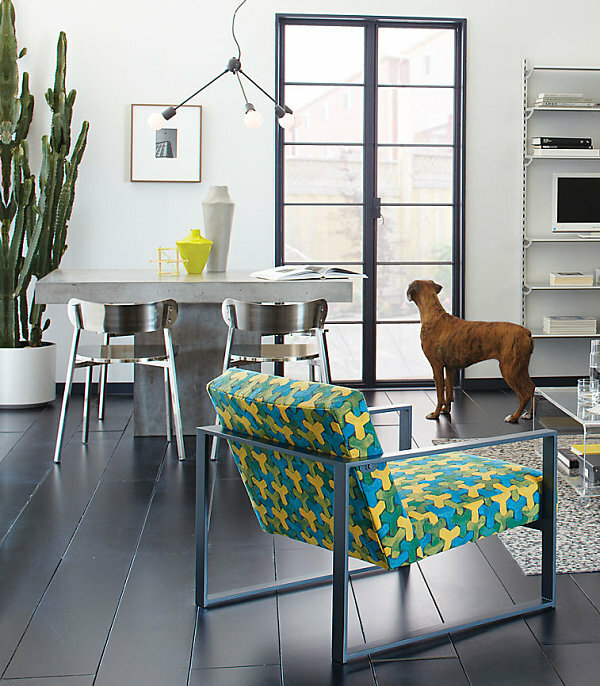 Not to mention, modern design enthusiasts have been making bold statements with geometric patterns for years. A bit Hollywood Regency, a bit contemporary, the Ammara 18″ Pillow from Crate & Barrel is a chain-stitched embroidered find, shown below with the Howell 20″ Pillow and the origami motif-covered Vianni Vase. 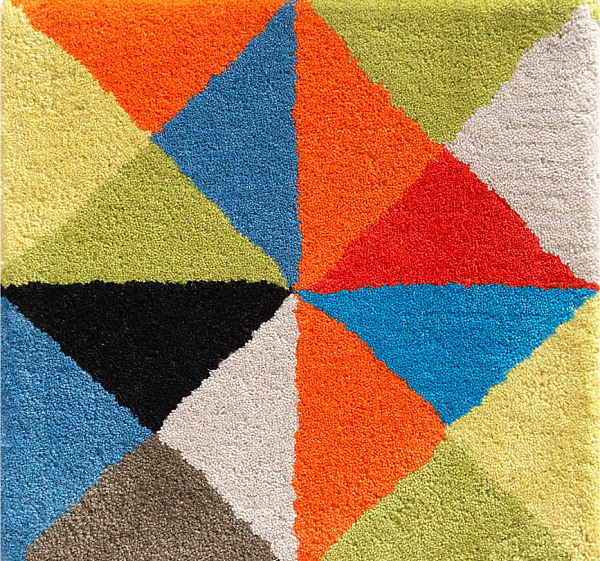 For a kaleidoscope effect, choose the Colored Crystal Runner from CB2, which is vibrant with its triangular pattern. This next image shows a close-up of the item, which is 100% hand-tufted wool. 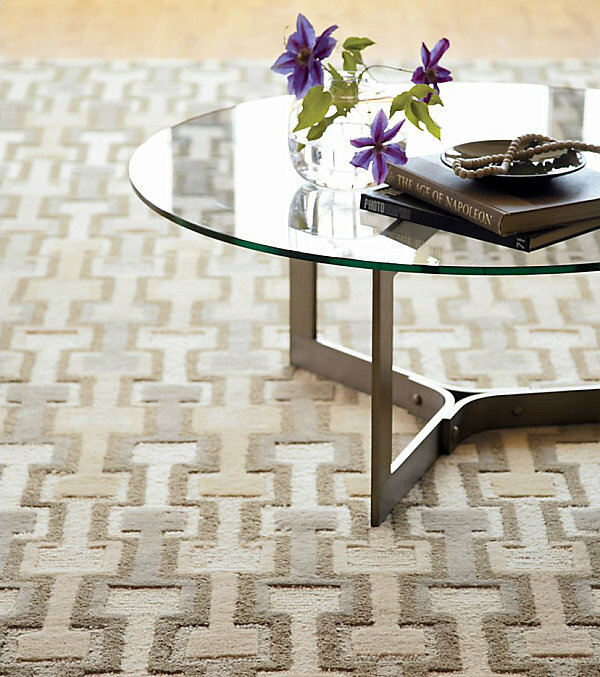 Interlocking geometry reigns with the Zamar Rug, also from CB2. Subtle in its neutral color palette, the rug refrains from dominating the room, which makes it perfect for mixing patterns or introducing bolder elements. It’s time to celebrate the hexagon! The Odeon Dhurrie Rug in chocolate and citrus is available at Z Gallerie. The item’s honeycomb pattern is perfectly striking due to a combination of light and dark tones. Not only is the rug available in three different sizes, it comes in a green-citrus and grey color palette as well! 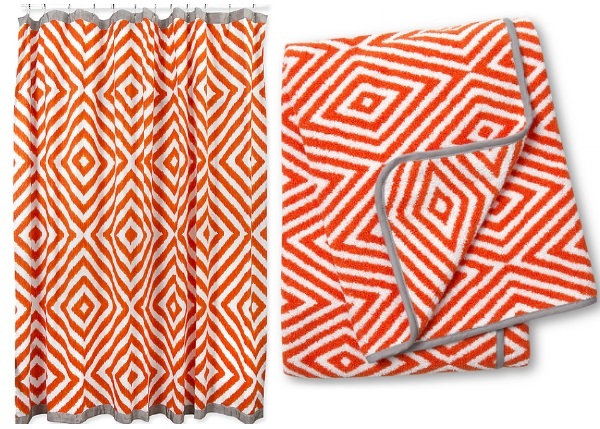 Diamonds are forever with the Arcade Bath Towel and Arcade Shower Curtain from Jonathan Adler. The radiant orange and white color scheme combines with gray trim for an eye-catching combination. Looking for a bathroom motif? 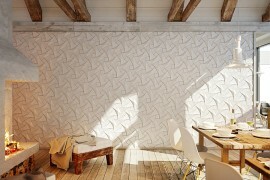 These accents should do the trick–they’re the next best thing to wallpapering! 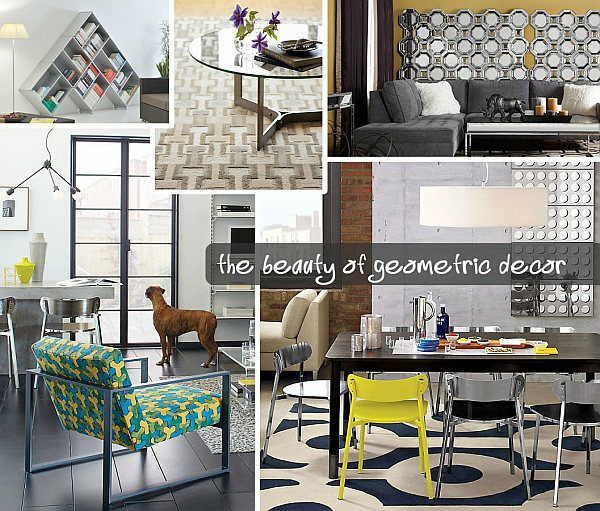 Establish a geometric motif from the highest point in the room! The pendant lights below dangle from the ceiling, setting the tone for the entire space from their high perch. The Oversized Equator Pendant Lamp from CB2 is off white to blend with a variety of color schemes. Not to mention, its cylindrical shape is simple and modern. In a room full of circles like the space below, this piece is a must! The Bau Pendant by Normann sets a retro tone. 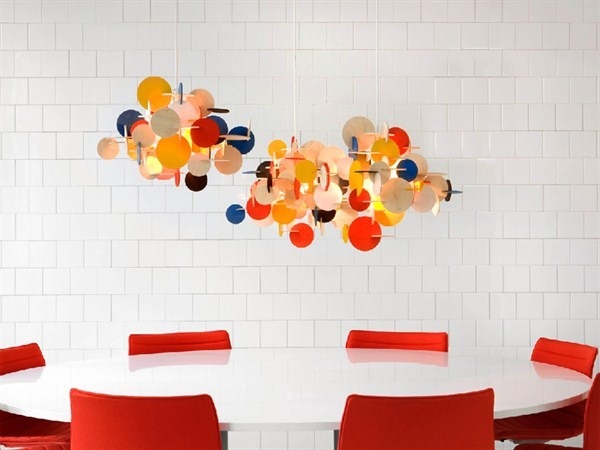 This sculptural hanging lamp designed by Vibeke Fonnesberg Schmidt is made of colorful basswood circles that seamlessly fit together in whimsical clusters. 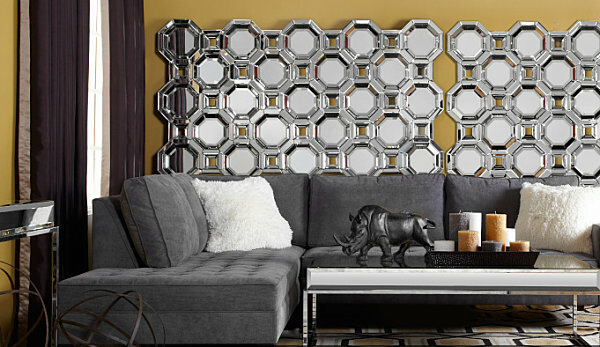 Shape up your walls with the Axis Floor Mirror from Z Gallerie (two are shown on the wall below). 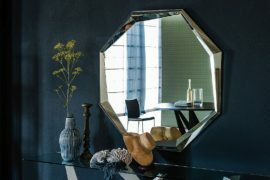 This impressive item consists of many small octagonal mirrors with beveled sides, joined together with smaller open square pieces to create a new standard for reflective geometry! 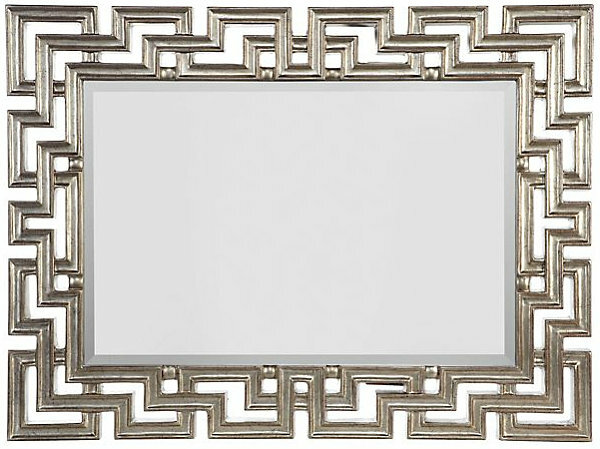 Z Gallerie also offers the Mykonos Mirror with a geometric frame that boasts the Greek Key design. An antique silver finish ensures that this piece truly shines! From mirror to wall art… This time the shape of choice is the square. 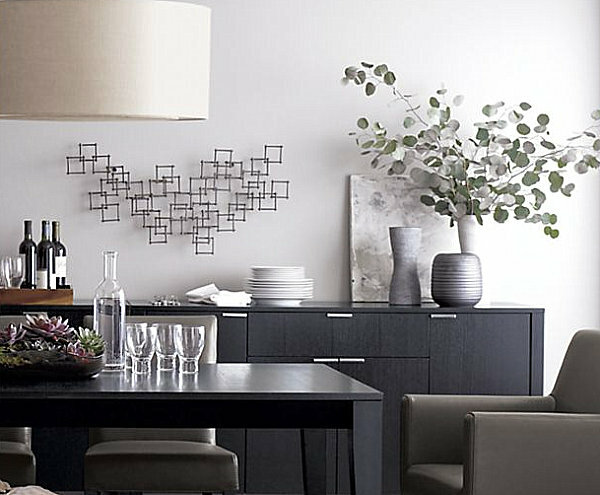 The Squares Nail Wall Art from Crate & Barrel is constructed of forged raw steel. The pieces overlap to form one large statement that conveys movement while remaining stationary on your wall. Modern magic! The MODULES below are offered by Fitting. Not only are they useful, they can be wall-mounted in artful arrangements. 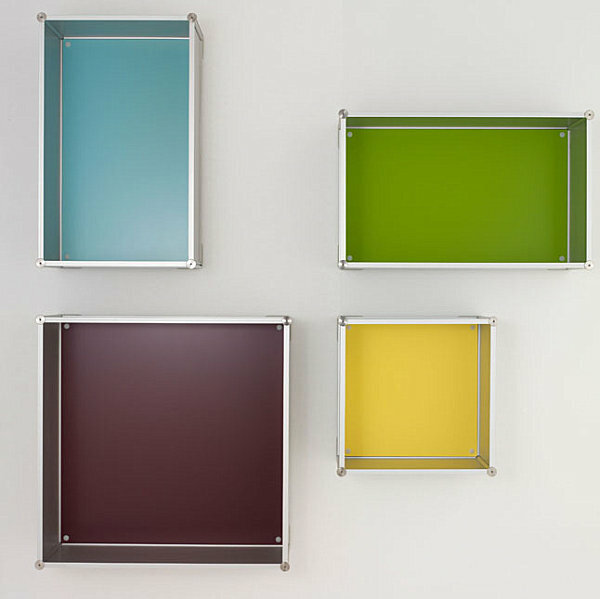 Crafted of aluminum silver, these square and rectangular pieces can include colorful backing upon request. The shadowbox-style shelves are perfect for containing your favorite collectibles. Don’t forget that items can also be displayed on top of each module! 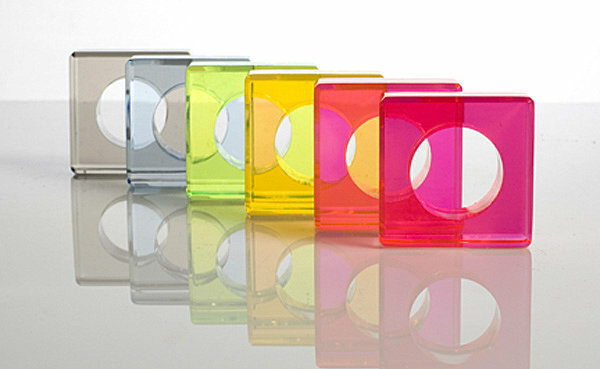 The Acrylic Napkin Rings from Alexandra Von Furstenberg are brighter than a neon sunrise! Use these pieces to set the table for your next dinner party, or create a work of art similar to the arrangement in this next image. The napkin rings are sold in sets of 6, and they can be ordered in Jewel Tones or Bright Neon Pop (shown below). 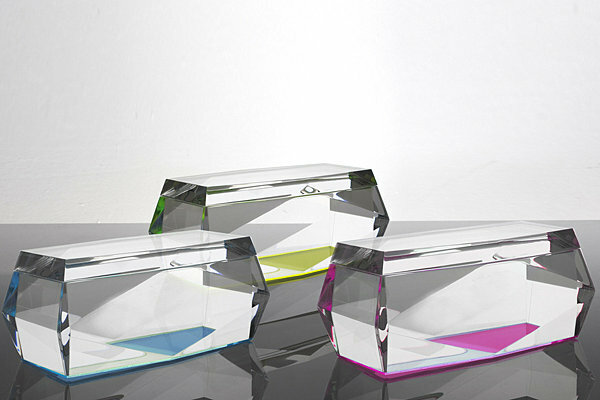 Geometric facets reign with the Acrylic Gem Box from Alexandra Von Furstenberg. 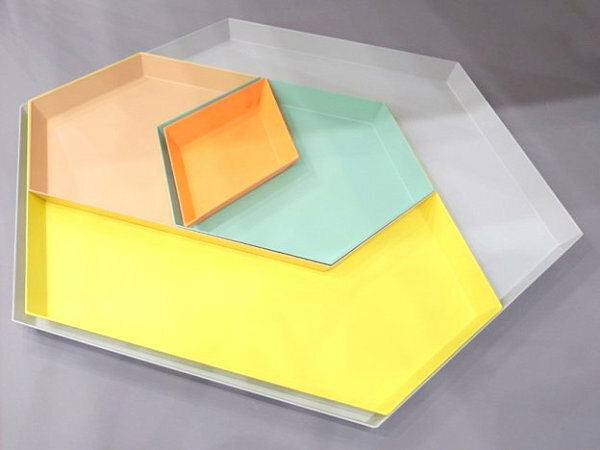 With the cut and clarity of a diamond, these pieces are available in a variety of colors for your tabletop enjoyment. 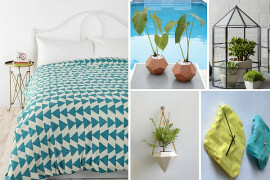 The beauty of geometric decor is its versatility. Go modern. Go retro. Go glam. It’s all possible! Not to mention, since geometric motifs are all over products from wallpaper to the smallest of decorative statements, it’s easy to incorporate shapely pieces into your space. Not sure how much geometry to add? Start small with a tray and work your way up to bedding! When it comes to shapes, it only takes one to steal the show, yet there’s always room for more!